I woke up this morning to a 2 hour delay for school/work due to freezing rain! 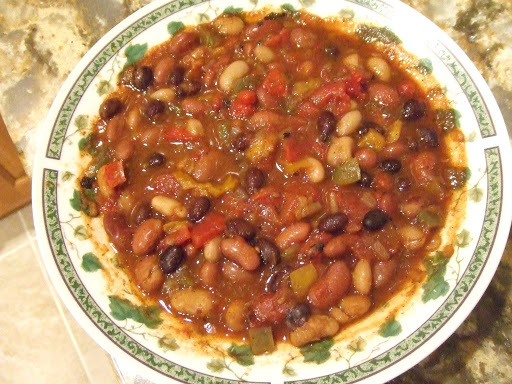 I think that means this is a perfect morning to post a recipe for this delicious, warm chili I made last week. 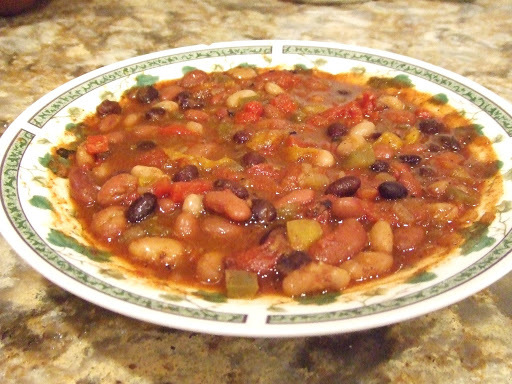 This chili is full of protein, vegetables, and taste. The seasonings in this chili were amazing! 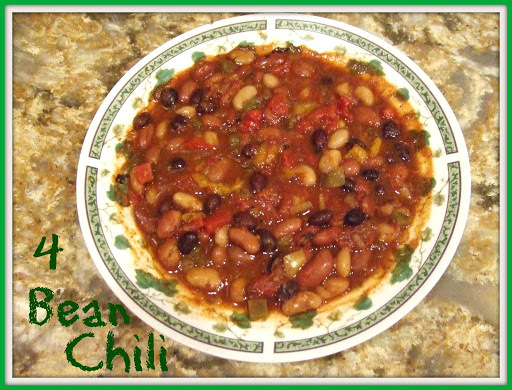 This chili is also another easy meal. Just toss everything into a crockpot (which requires very little chopping) and let it work its magic. Cook on high for about 4 hours or low for about 8 hours or until ready to serve. Since my mom is not a fan of really spicy food, I kept the spice level down. However, feel free to add more spice if you like a spicier meal. I thought the cinnamon helped give this chili the perfect sweet & spicy flavor though. 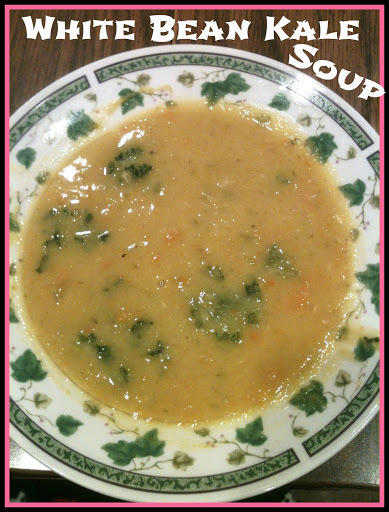 This was so easy and tasty and made plenty so that I had leftovers for lunch the next day! I cannot wait to make this delicious meal again! I am roughly estimating that this chili makes 8 hearty bowls. One serving yields approximately 213 calories and 12g protein. Back when I used to eat dairy products and eggs, I was definitely guilty of eating cookie dough straight from the container. The risk of salmonella? Totally worth it in my eyes (I was young haha). And when I got older and knew it was not a risk worth taking, well just a tiny bit of dough wouldn’t hurt, right? Like maybe just a spoonful? Or two? Okay, maybe three, but that is definitely all. Well, now that I no longer eat animal products, I do not have to worry about the risk of salmonella at all. And the best part is I can still enjoy cookie dough! While this recipe doesn’t taste exactly like cookie dough, it definitely resembles it and is much healthier than regular cookie dough. In a food processor, combine all ingredients except almond milk and chocolate chips and blend until smooth. Taste and adjust sugar to desired sweetness. With a spoon, stir in chocolate chips. I recommend using more coconut sugar if you want a sweeter cookie dough and maybe even increase the vanilla extract to 2 tsp. You can also use brown sugar in place of the coconut sugar. This cookie dough is great for dipping fruits. It can also be used to spread on graham crackers, toast, or eaten right off the spoon! 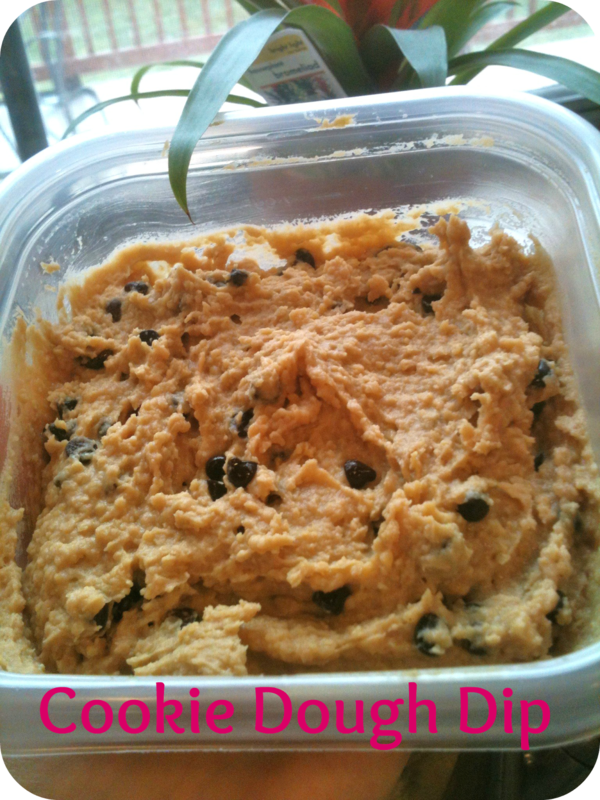 Keep this cookie dough stored in an airtight container in the fridge. This recipe makes about 1.5 cups of Cookie Dough. Based on using Goya Chickpeas, Peanut Butter & Co. Mighty Maple Peanut Butter, Coconut Sugar, original PureAlmond milk, and Enjoy Life mini chocolate chips: 2 tbsp yields approximately 90 calories and 4g protein. I have been trying to drink more smoothies lately to increase my nutrition: protein, calories, nutrients, fruits, veggies, etc. This smoothie, however, does not contain any veggies. I usually love green smoothies but I was really in the mood for something sweet. I enjoyed this as a morning snack which is interesting since I have noticed I have a much bigger sweet tooth in the morning and more savory cravings in the evenings. 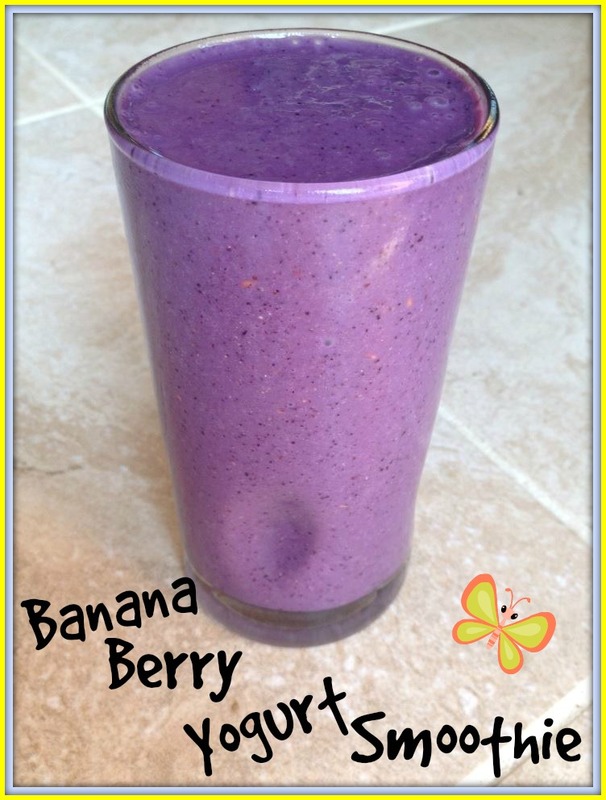 Directions: In a blender combine all ingredients and process until smooth and creamy.This smoothie makes 1 large serving! 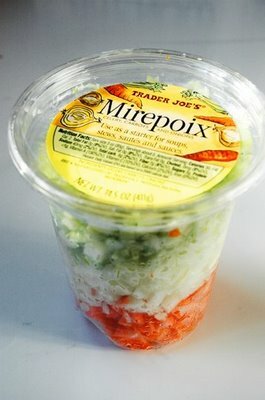 *Usually I have individual containers of So Delicious brand Greek style plain yogurt. I love having this because I never know if I just want to eat yogurt as a snack with some fruit or mixed into smoothies or oatmeal. I can easily just use one or half of one of these containers without worrying about the yogurt going bad. Sometimes I use this unsweetened one which is better for only smoothies or oatmeal since it gets natural sweetness from the other ingredients and doesn’t need the extra sugar. It is also great since it comes in a big container and is more cost efficient. However, once it is open you need to use it relatively quickly. You could also use a flavored yogurt for a different flavor smoothie! And if you want a smoothie with more protein, you can add some protein powder or I’m sure nut butter would taste amazing in this smoothie, kind of like a peanut butter and jelly! Based on using original PureAlmond Milk, So Delicious Greek plain yogurt, and Bob’s Red Mill Ground Flaxseed Meal, this smoothie yields approximately 275 calories and 4g protein. With So Delicious Unsweetened yogurt, this smoothie yields approximately 240 calories and 3g protein. I was craving something sweet for breakfast on Monday morning. I guess since it was the beginning of the week, I wanted something comforting. This oatmeal hit the spot. I cannot wait to make it again! In a microwave safe bowl, combine oats, almond milk, a dash of sea salt and heat in the microwave for 1 minute. Stir in cocoa powder and heat for another 1 minute watching closely to avoid spillage. 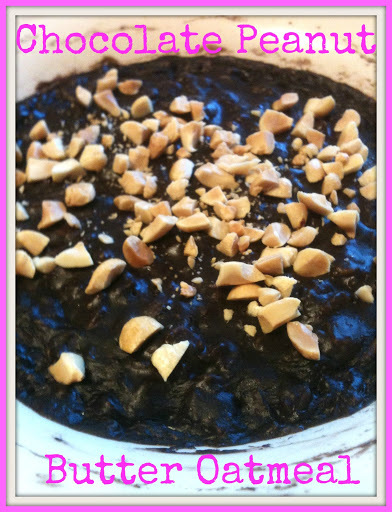 Allow it to sit in the microwave or on the counter for about 10 minutes. Place in the fridge overnight to soften the oats and add volume. In the morning, reheat for about 1 minute. 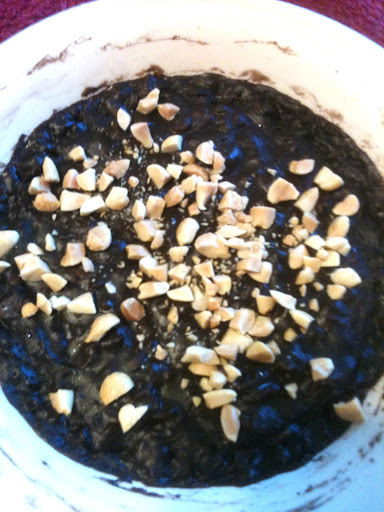 Stir in mashed banana and chocolate peanut butter. Even though I used chocolate peanut butter, adding the extra cocoa powder took this breakfast beyond amazing. The peanuts added a nice crunch and helped make the peanut taste stand out. 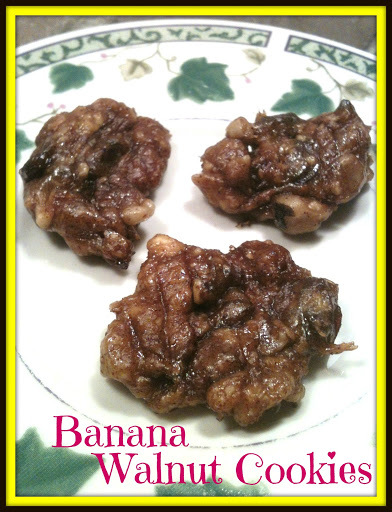 The banana added sweetness, creaminess, and increased the flavor. Chocolate peanut butter and banana = amazing! Based on using Trader Joe’s Gluten Free Rolled Oats and Silk Original PureAlmond Milk, this recipe yields approximately 290 calories and 10g protein. With these colder months, I have been making a lot of soups, stews, and chilis. 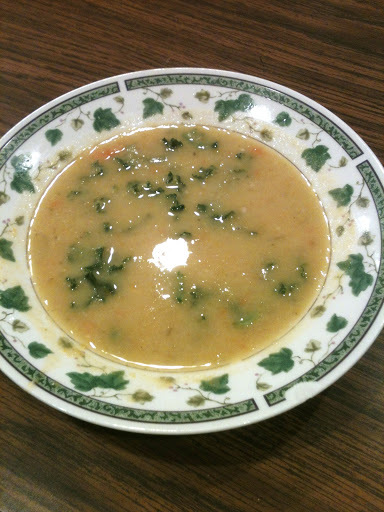 This recipe is one of my family’s favorite soups. Heat olive oil in a large pot over medium-high heat. Add the onion, carrots, celery, garlic and oregano and saute until the onion is translucent. Add the broth, beans, and nutritional yeast. Increase the heat to high and bring to a boil. Once it begins to boil, reduce the heat to low and simmer 20 minutes, or until the carrots are soft. Add kale and allow to simmer for about 4 more minutes. Season with salt and pepper, serve, and enjoy! This soup tastes best the next day. However, the soup is so good it is hard to wait that long! I highly recommend doubling the recipe so you can eat some immediately and save the leftovers for another day. I am roughly estimating that this recipe makes six servings. One serving is approximately 175 calories and 9.5g protein. 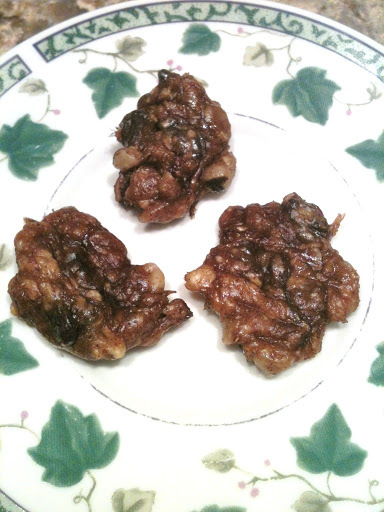 If you have a dehydrator, this is a great recipe to make a simple, raw, and nutritious cookie! This recipe was adapted from here. I quadrupled the recipe so I would have extras. Spoon into 40 cookies on a dehydrator sheet. Dehydrate at 115 for 8-10 hours. After my cookies were finished in the dehydrator, I let them sit out on the counter for a day and the next day they were the perfect consistency. These are also great portable snacks to pack and take with you for work, school, traveling, etc. It would be fun to try adding different ingredients in these cookies, like chocolate chips, peanut butter, or different nuts! If you don’t have a dehydrator, I’m sure you can still make this cookie in the oven at a low temperature. I haven’t tried these in the oven myself though, so I am not sure what temperature the oven should be set at or for how long. Based on making 40 cookies, each cookie yields approximately 32 calories and <1g protein. 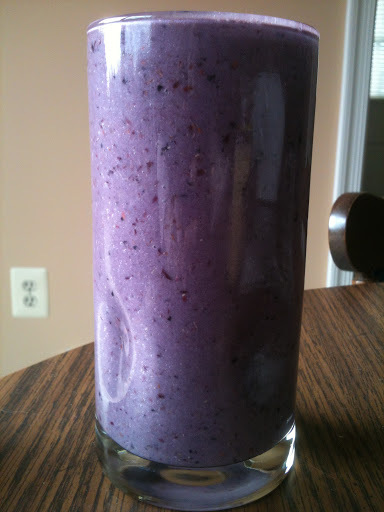 Blueberry Beet Overnight Oats – It looks purple in the picture, but in person it was a bright pink color! 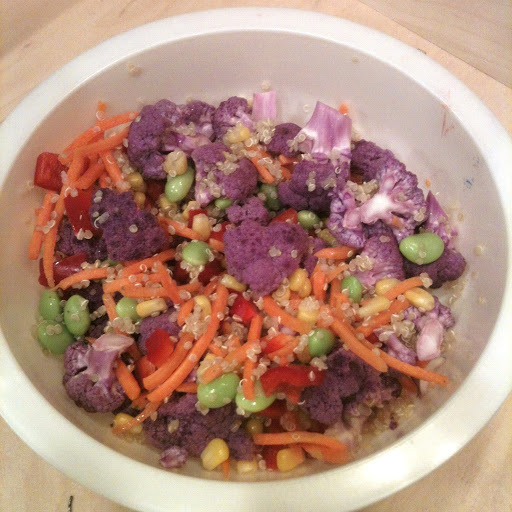 I definitely want to try out more recipes to naturally turn my food fun colors! Today I have a recipe that includes a rainbow of colors. I had heard of purple cauliflower but never tried it before. I love white cauliflower so I decided to give the purple cauliflower a try. 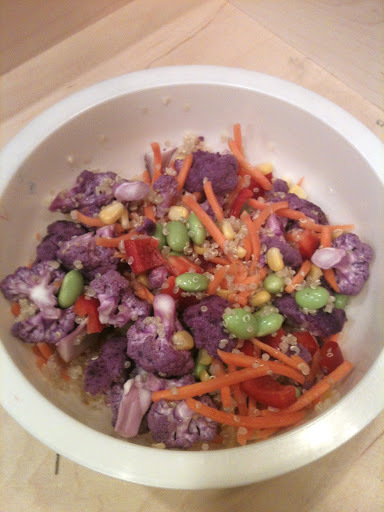 To me, it tasted exactly like the white, so I enjoyed using this purple cauliflower to add even more color to my food. 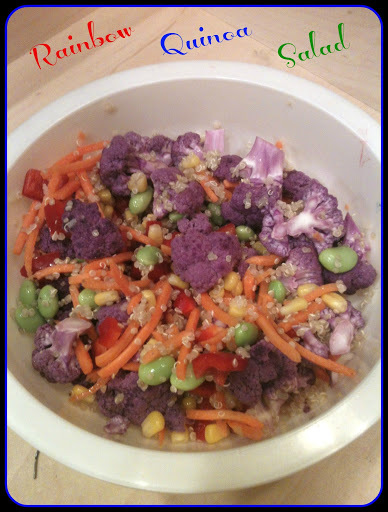 What better way to incorporate purple cauliflower than in a Rainbow Quinoa Salad! Once quinoa is cooked, mix together all ingredients. 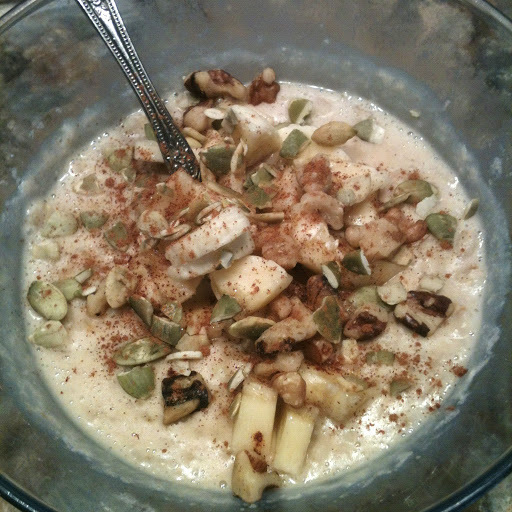 This recipe has become one of my favorite oatmeal recipes in the morning. One can never go wrong with the combination of peanut butter and banana. 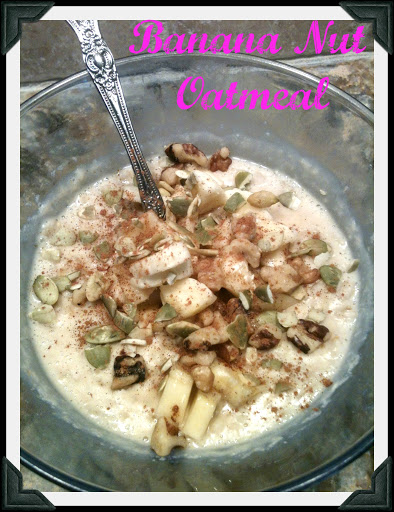 Add in a few extra nuts and seeds and this recipe makes a filling and nutritious breakfast! Combine oats, almond milk, and sea salt. Heat for 1 minute, stir, and let sit on the counter for 10 minutes. Cover and refrigerate overnight. (This helps make the oats soft. Alternatively you can refrigerate the oats without heating first for less soft oats, or you can omit this step completely). The next morning, reheat the oats 1-2 minutes in the microwave. 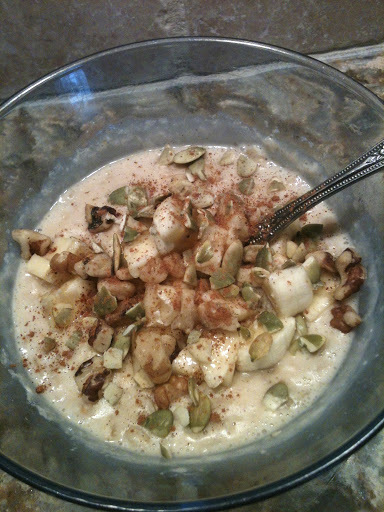 Add banana slices, walnuts, pumpkin seeds, and cinnamon. I like to make the oats overnight and pre-measure the nuts and seeds. Then, in the morning, it is really easy to heat the oats, slice a banana while that is heating, and then stir everything into the oats. Based on using Trader Joe’s GF Rolled Oats, original Silk PureAlmond milk, and Peanut Butter & Co. Mighty Maple, this recipe yields approximately 313 calories and 8.5g protein.If you add in the extra 1/2 banana that is mashed, the recipe yields approximately 368 calories and 9g protein. After all the cooking and baking I did on Christmas Eve and Christmas Day, I decided to keep New Year’s Eve an easier night to prepare dinner. I made less food and nothing as spectacular or special. Combine tamari, mirin, garlic powder, onion powder, and sesame oil into a wide, shallow container and stir to combine. Add tempeh, toss to coat, cover, and set aside to let marinate for at least 30 minutes. (I let mine sit overnight and almost all the marinade soaked into the tempeh). Heat 1/2-1 tbsp oil in a large skillet over medium heat. Drain any leftover marinade from the tempeh. Add the tempeh to the skillet and cook, turning frequently, about 5-7 minutes or until golden brown. This meal was really good! I ate a large serving of this Sweet Potato Tempeh since it was the main part of my meal, but it is probably a better recipe for a side dish. However, to make it more of a meal, you could probably even add Kale to it and Quinoa or brown rice. I definitely should have done that and the next time I make this as a meal think I will try adding those ingredients. For dessert I made Pineapple Spongecake from Everyday Happy Herbivore. I’m still perfecting the recipe since I have to make it gluten-free and haven’t yet found the right flour, but it was tasty and if you own the book I definitely recommend giving it a try. If you don’t own the book, I definitely recommend buying it because there are a ton of simple, delicious recipes. A new book has even been published, Happy Herbivore Abroad, which I just bought and cannot wait to try out some new recipes! 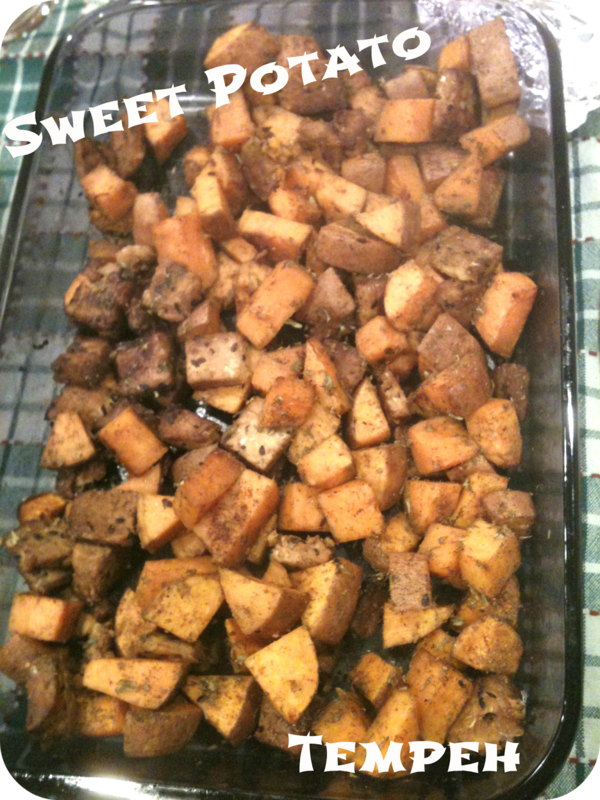 Based on making 6 side dish servings, 1 serving yields approximately 252 calories and 10g protein.